Temperatures are dropping, and in many parts of the country, this is one of the nicest times of year to get out and exercise! Cooler daytimes temperatures, beautiful changing leaf colors, and the awareness that snowed in days are coming, all motivate us to get out for a nice walk. Make sure that your walks are as pleasant and safe as possible with this easy guide. You may find that your best friend is so frisky on these cooler mornings that there’s nothing you can do to say no to her. Here are some fun activities to do with your dog in this lovely weather, including some indoor activities for the first snow days of the season. As if the lovely weather wasn’t enough incentive, we’re offering some useful tools for walking your dog. In this Giveaway, one lucky winner will get both of these great prizes shipped to your home at no charge to you. It’s easy! Just follow these three simple steps. Go to the Facebook post for this Giveaway and like, leave a comment or share it. Login to the widget below by using email and earn more entries. We’ll contact you via Facebook or Email if you’re the lucky winner. Don’t wait to enter– the giveaway ends on November 12th, 2018! The Flexilead has become a new standard in the dog-owning community. 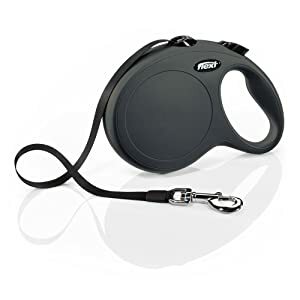 These convenient leashes let out and take in lead as your dog moves, allowing her much more freedom than a standard leash but still keeping her safely under your control. On these cool days when your dog is too energetic to stay by your side, a flexi leash can let her run out her energy running around you while you enjoy a walk at the pace of your choice.This leash is made by the trusted original maker of retractable leashes, Flexi, and is approved for dogs up to 110 pounds. Keep in mind that you should only use a retractable leash if your dog is generally well behaved since they don’t offer as much control as standard leashes. Staying hydrated is essential for both you and your dog while you are exercising. 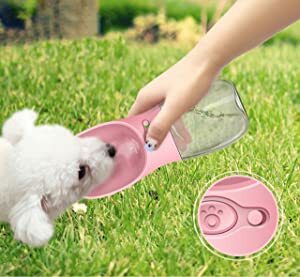 As temperatures get cooler, we may be less reminded to stay hydrated, but it is still very important that both you and your dog drink plenty of water on your walk.This handy portable water bottle lets you carry water in a leak-free design, and also comes with an innovative bowl attachment that lets your dog lap up just as much as she needs, without wasting water or contaminating the water supply. 12 oz is a good amount for the average walk, without being too bulky or heavy for you to conveniently carry. 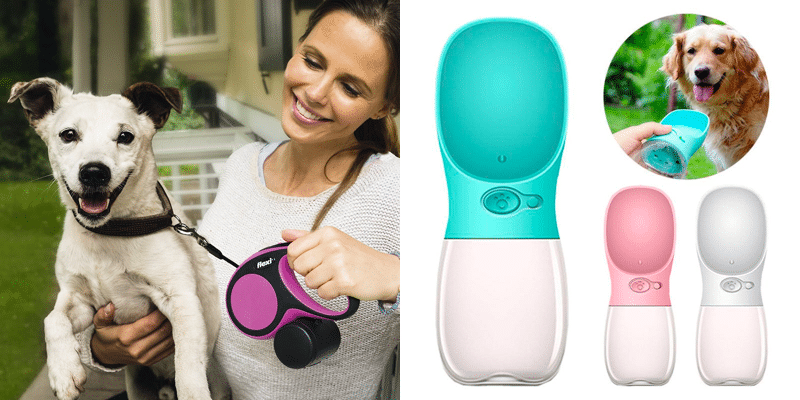 When you win, let us know if you’d like the blue or pink version for your dog! This is very cute and versatile. I would love a water bottle for my dog! RIght now I have a silicone water bowl but it spills if tips over and my car gets wet. The bottle for water sounds like a great alternative! The water bottle is great — easy to use and convenient. Will be terrific for giving drinks while in the car. I have 2 hound babies that love exploring the local conservation areas and this would be a wonderful prize to win! I have owned many Flexi leashes in my life, and I love them. I think my boy just likes the extra space to explore without me being so close to him. I would love to have a retractable leash so that when it is safe I can allow him more freedom. The water bottle would be great for those long walks – we walk on trails and dirt and he gets thirsty! The articles were informative and interesting to read. Would love to get a new retractable leash, since the pups broke the last one. Thanks for the chance. That water bottle is genius!! I’d love one for my dog, super convenient for walks! Im 33 and finally getting my first doggy after a lifetime of loving them! I feel so blessed and happy! This is a very useful giveaway! Thanks for the opportunity! The Flexi New Classic Retractable Dog Leash would be great for Sheba and me since we take long walks daily. I have seen positive reviews on this brand. Thank you so much for this wonderful giveaway! Walking my dog will be so much nicer with a retractable leash and I won’t have to worry that she’s thirsty while we’re out!